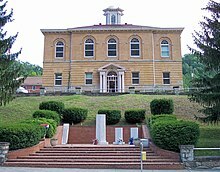 Clay County is a county in the U.S. state of West Virginia. As of the 2010 census, the population was 9,386. Its county seat is Clay. The county was founded in 1858 and named in honor of Henry Clay, famous American statesman, member of the United States Senate from Kentucky and United States Secretary of State in the 19th century. 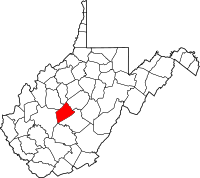 Clay County is part of the Charleston, WV Metropolitan Statistical Area. According to the U.S. Census Bureau, the county has a total area of 344 square miles (890 km2), of which 342 square miles (890 km2) is land and 1.9 square miles (4.9 km2) (0.6%) is water. As of the census of 2000, there were 10,330 people, 4,020 households, and 2,942 families residing in the county. The population density was 30 people per square mile (12/km²). There were 4,836 housing units at an average density of 14 per square mile (5/km²). The racial makeup of the county was 98.22% White, 0.08% Black or African American, 0.71% Native American, 0.02% Asian, 0.09% from other races, and 0.89% from two or more races. 0.41% of the population were Hispanic or Latino of any race. There were 4,020 households out of which 33.50% had children under the age of 18 living with them, 58.20% were married couples living together, 10.40% had a female householder with no husband present, and 26.80% were non-families. 24.30% of all households were made up of individuals and 11.40% had someone living alone who was 65 years of age or older. The average household size was 2.55 and the average family size was 3.01. In the county, the population was spread out with 25.60% under the age of 18, 9.00% from 18 to 24, 27.50% from 25 to 44, 24.20% from 45 to 64, and 13.70% who were 65 years of age or older. The median age was 37 years. For every 100 females, there were 97.90 males. For every 100 females age 18 and over, there were 97.30 males. The median income for a household in the county was $22,120, and the median income for a family was $27,137. Males had a median income of $30,161 versus $16,642 for females. The per capita income for the county was $12,021. About 24.40% of families and 27.50% of the population were below the poverty line, including 37.00% of those under age 18 and 15.00% of those age 65 or over. As of the 2010 United States Census, there were 9,386 people, 3,728 households, and 2,566 families residing in the county. The population density was 27.5 inhabitants per square mile (10.6/km2). There were 4,572 housing units at an average density of 13.4 per square mile (5.2/km2). The racial makeup of the county was 98.8% white, 0.2% American Indian, 0.1% black or African American, 0.1% Asian, 0.1% from other races, and 0.8% from two or more races. Those of Hispanic or Latino origin made up 0.4% of the population. In terms of ancestry, 17.6% were Irish, 14.7% were English, 13.2% were German, 11.0% were American, and 5.0% were Dutch. Of the 3,728 households, 31.3% had children under the age of 18 living with them, 53.6% were married couples living together, 9.7% had a female householder with no husband present, 31.2% were non-families, and 26.2% of all households were made up of individuals. The average household size was 2.50 and the average family size was 3.00. The median age was 41.5 years. The median income for a household in the county was $30,789 and the median income for a family was $40,634. Males had a median income of $42,269 versus $24,402 for females. The per capita income for the county was $16,205. About 22.4% of families and 23.7% of the population were below the poverty line, including 29.3% of those under age 18 and 21.1% of those age 65 or over. Clay County was formerly reliably Democratic, but it has shifted sharply Republican in recent years. In the motion picture The Silence of the Lambs, the victim was found in the Elk River in Clay County. Clay County is also the birthplace of the Golden Delicious Apple. The original tree was found on the Mullins' family farm in Clay County, West Virginia, United States and was locally known as Mullin's Yellow Seedling and Annit apple. ^ a b "State & County QuickFacts". United States Census Bureau. Retrieved January 9, 2014. ^ "2010 Census Gazetteer Files". United States Census Bureau. August 22, 2012. Retrieved July 23, 2015. ^ "U.S. Decennial Census". United States Census Bureau. Archived from the original on May 12, 2015. Retrieved January 9, 2014. ^ "Historical Census Browser". University of Virginia Library. Retrieved January 9, 2014. ^ "Population of Counties by Decennial Census: 1900 to 1990". United States Census Bureau. Retrieved January 9, 2014. ^ "Census 2000 PHC-T-4. Ranking Tables for Counties: 1990 and 2000" (PDF). United States Census Bureau. Retrieved January 9, 2014. ^ a b c "DP-1 Profile of General Population and Housing Characteristics: 2010 Demographic Profile Data". United States Census Bureau. Retrieved 2016-04-03. ^ "Population, Housing Units, Area, and Density: 2010 - County". United States Census Bureau. Retrieved 2016-04-03. ^ "DP02 SELECTED SOCIAL CHARACTERISTICS IN THE UNITED STATES – 2006-2010 American Community Survey 5-Year Estimates". United States Census Bureau. Retrieved 2016-04-03. ^ "DP03 SELECTED ECONOMIC CHARACTERISTICS – 2006-2010 American Community Survey 5-Year Estimates". United States Census Bureau. Retrieved 2016-04-03. This page was last edited on 15 August 2018, at 18:53 (UTC).